SAN DIEGO — I have a confession: it’s years since Arv and I visited Catalina. Why, when it’s the most popular SoCal boating destination? We love Mexico and heed the siren’s call to Ensenada whenever possible – which means we’ve neglected cruising destinations to our north, including Catalina. Recently, in talking with friends who are Catalina regulars, we’ve decided it’s time to return to the island. Now I’m doing my research. Fortunately, whether you’re traveling from San Diego or points north, it’s an easy, straight shot from the California coast to either Avalon or the many coves around Two Harbors. Even so, make sure your electronic charts are updated and you carry paper charts as a backup, just in case of an equipment or power failure. Now that Labor Day is past, typically scarce moorings are likely to be somewhat more available around the island. Remember, moorings in Avalon are first-come, first served, and are assigned by the Harbor Department (310-510-0535, Channels 12 & 16), which offers a special reduced rate from September 15 through June 15. For moorings in and around Two Harbors reserve online through the Catalina Island Company, Isthmus office, at visitcatalinaisland.com/MooringRez, for a minimum two-night stay. 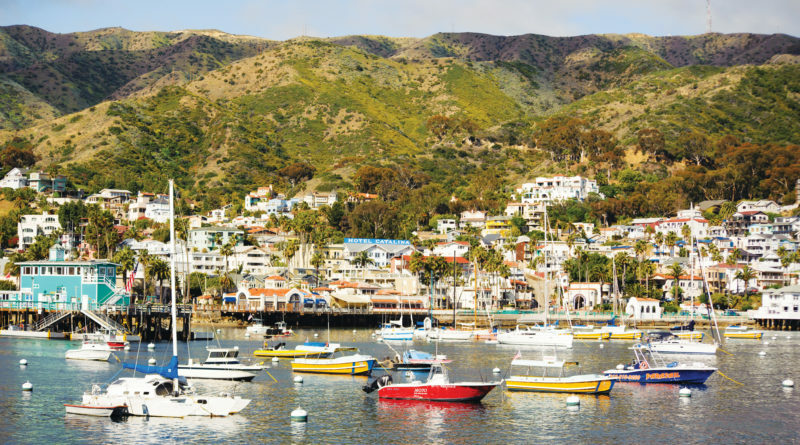 When we last visited Catalina we stayed in Avalon, experiencing the charm and the attractions of the island’s only incorporated city, where 90 percent of Catalina’s about 4,100 residents live. We are enthusiastic tourists and took great delight in exploring the city’s sights, touring the restored Casino (actually a theater and ballroom built by Catalina Island’s then-owner, William Wrigley of chewing gum fame) and the Catalina Island Museum, where we discovered the storied Catalina tile, visible on older buildings all over town. The museum has since relocated to larger quarters in its own building on Metropole Avenue. We also walked around residential areas, where friendly tuxedo cats roaming the community delighted us, and climbed up to see spectacular views from Mt. Ada, Wrigley’s former home named for his wife, now an upscale B&B. We were surprised while walking to see culled island bison herded through the streets of Avalon to a dockside barge, which transported them to the mainland, the start of their transfer to South Dakota tribes. Now contraception darts keep the herd capped at a sustainable 150 animals. Bison are not native to Catalina, but were brought there – and abandoned – for a 1924 Hollywood film. While Avalon hosts most island hotels, restaurants, shops and populace, much of the island is undeveloped open space with captivating, varied topography. We took a fascinating tour into Catalina’s interior, where we visited the Wrigley horse ranch, El Rancho Escondido, now home to Rusack Vineyards, and stopped at the island’s delightful airport, the Airport in the Sky, all worth a repeat visit. Avalon is touristy and often crowded, especially with regular arrivals of cruise ship passengers and mainland tourists. For a quieter Catalina experience at the island’s west end check out the more rustic Two Harbors, the twin bays of Catalina Harbor and Isthmus Cove joined by an isthmus, both of which offer moorings and anchorages, along with campsites, lodging, restaurants, a general store, diving, snorkeling, fishing and other recreational activities, plus visitor and boating services. Two Harbors is home to October’s piratical party, Buccaneer Days. Nearby are numerous tranquil coves with moorings and anchorages, offering the perfect escape from urban stresses. Catalina, I understand, is much changed since our last visit, with many new activities and dining options. I’m looking forward to discovering the island anew. For full Catalina boating and tourist information see visitcatalinaisland.com, which also hosts the downloadable Two Harbors Visitors Guide.